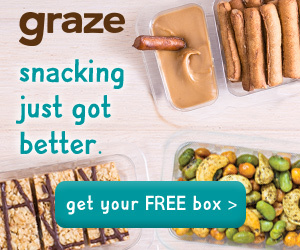 Graze is snack subscription service that is offering new members a FREE 4 Snack Sample Box ($1 Shipping) that includes four different yummy, nutritious snacks! Click this link to sign up to get your 4 snack sampler box for free plus $1 shipping and look for it to arrive within 14 days. After your free trial, you will receive regular deliveries of the 8 snack variety box every 2 weeks for just $13.99 each. You can change or cancel your orders at any time. This is a subscription service. You'll get your first snack sampler box with 4 snacks free + $1 shipping and your other full-size boxes will cost $13.99 each and include 8 snacks. They send new boxes every two week and you only pay per box, so there's no commitment. Cancel at any time online by logging into your account then clicking on your name at the top right. Select "your deliveries", then "change how often" then click on "cancel your deliveries" at the bottom. They make delicious, healthy snacks and deliver them to you by mail. Boxes are filled with delicious and nutritious food. From nuts, seeds, dried fruits, tasty crackers, dips to some well-deserved treats, every Graze snack has a healthy benefit.